Thomas Gainsborough (1727-88) was born in Sudbury and was baptized at the Independent Meeting-House in Friars Street on 14 May 1727, the fifth son and ninth child of John and mary Gainsborough. He lived in Sudbury until around 1740 when, as a young teenager, he was sent to London to pursue a career as an artist. He returned to Sudbury in the spring of 1749 where he painted his celebrated Mr and Mrs Andrews (c.1750, National Gallery, London). His search for patronage and critical success led him to move to Ipswich around 1752 and subsequently to Bath and London, although he never lost the influence of his native town and county. ‘Nature was his teacher, and the woods of Suffolk his academy,’noted an obituary after his death in 1788. 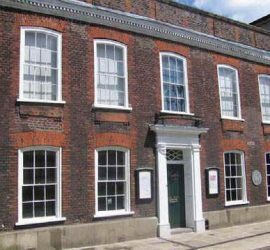 In 1958 Gainsborough’s House Society was formed to purchase the house and establish it as a centre for Thomas Gainsborough. The Museum opened to the public in 1961 and has remained open for over 50 years. The beautiful garden is at the heart of Gainsborough’s House. It is maintained by a devoted body of volunteers who garden exclusively with plants that were available in Gainsborough’s lifetime.